Endemic to central Jamaica where logging is the main threat to this valuable timber tree. Endemic to Central Jamaica where it occurs in the Parishes of: Claredon, St. Catherine, St Ann and Trelawny. 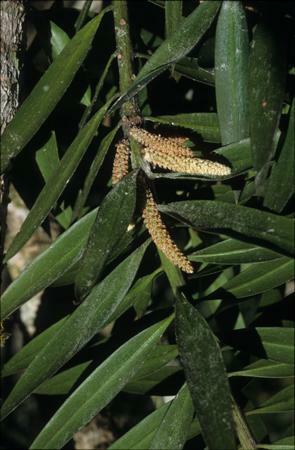 Historically the population of Podocarpus purdieanus must have been much more widespread but due to the value of the timber the species has been significantly exploited and consequently the number of mature individuals, the extent of occurrence and area of occupancy have declined significantly. 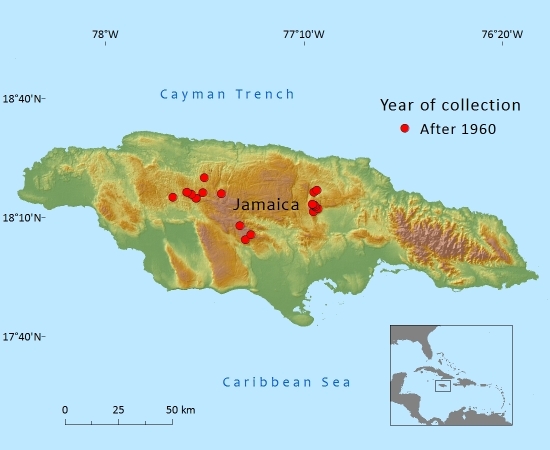 Distributed in three distinct locations, the most notable being on Mt Diablo, on the border of the Parishes of St Ann and St Catherine, and in the Cockpit Country in the Parish of Trelawny. The sub-population in Cockpit Country could be considerably larger and even extend into the neighboring parish of St James. The sub-population in the Parish of Clarendon is found in forests on limestone hills with a similar topography to the Cockpit Country but on a smaller scale. Here it is more scattered, not on any specific mountain range but on characteristic craggy limestone hills that form little islands of vegetation surrounded by agriculture and settlements. This sub-population may also extend into the neighboring Parishes of Manchester and St Elizabeth. Occurs in wet limestone forests with an altitudinal range from 350 to 870m. 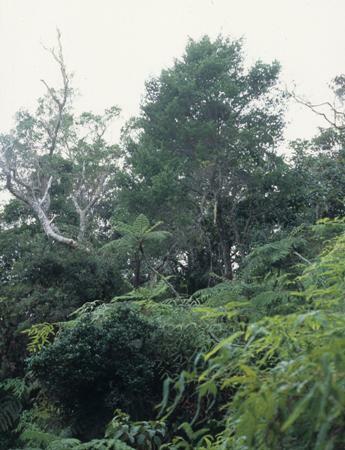 These forests are often very dense and the frequently ocurring tall tree species include: Terminalia latifolia, Cedrela odorata, Calophyllum jacquinii and Pithecellobium alexandri (Asprey & Robbins, 1953). Podocarpus purdieanus' area of occupancy (AOO) is estimated to be 48km² which is within the threshold for Endangered under criterion B. All locations are severely fragmented as a result of a historical decline due to logging and the conversion of land for agricultural purposes. Present day threats such as mining, illegal logging and deforestation associated with the conversion of forests for agriculture and grazing are causing a continuing decline in the area of occupancy and quality of habitat. On this basis it is assessed as Endangered B2ab(ii,iii,v). In the 19th century it was said to grow in "woods on mountain ridges" and to be "one of the noblest trees in the island." Historically, it was probably used for rebuilding ships; some logging continues. The original native forest of Mount Diablo was dominated by Podocarpus purdieanus but during the early twentieth century, the area was logged intensively and large areas converted to blue mahoe (Hibiscus elatus) plantations. Present day threats include deforestation and cutting saplings for yam sticks. 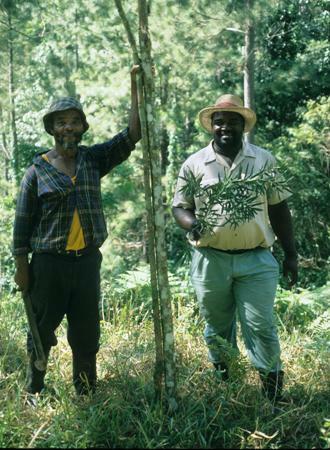 One million yam sticks are required per year, not just made from Podocarpus, but saplings and small trees are taken from the forest where this species grows. Mount Diablo consists of 2250 ha which is state-owned and the remaining 7150ha is under private ownership, including mining companies who are concerned with extracting bauxite through open-cast mining (Birdlife IBA). Other threats here include the conversion of the forest for agriculture, forestry plantations, rural settlements, illegal logging all of which has left the forest severely fragmented. 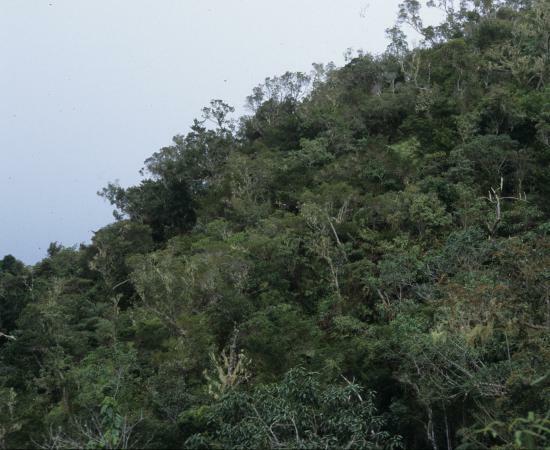 The most protected location is in the Cockpit Country, however this area is notable for its substrate that contains Bauixte; Jamaica is the third biggest producer of this important ore. Podocarpus purdieanus occurs in some forest reserves where logging is restricted, however, enforcement and monitoring is problematic. Asprey, G.F. & Robbins, R.G.. (1953). The Vegetation of Jamaica. Birdlife IBA. Important Area Factsheet. Mt Diablo. Available at: www.birdlife.org/datazone/userfiles/file/IBAs/CaribSitePDFs/JM008.pdf. (Accessed: 1 September 2011). K.Campbell,and M.F.Gardner, 2015. Podocarpus purdieanus, from the website, Threatened Conifers of The World (http://threatenedconifers.rbge.org.uk/taxa/details/845).